1. Cakewalk Sonar Producer Edition 7. (2007) PC DAW. 2. Yamaha CBX-K1XG (1995). Bought in 1996 primarily as a tone generator and used to produce Jan's first Airwolf Theme covers in the mid-90s. During Airwolf Themes' development it served primarily as a tool to create mock-up arrangements, however some of its waveforms were sampled by Jan into the Yamaha Motif XS and actually used on the final 'Airwolf Extended Themes' album. 3. Roland D-50 (1987). This is a true gem in Jan's synth collection as it bears the signature of pioneering French composer, performer and music producer, Jean Michel Jarre. Bought in 2005 to serve both as a master keyboard and a vintage tone generator. The D-50 sound is not present on the final cut of AET, it was however essential for some mock-up arrangements. 4. Yamaha AN1x (1997). 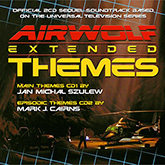 Purchased in 2006 around the time that Jan's involvement with Airwolf Extended Themes began. The go-to synth for almost any analog synth sound you can imagine (yes, it can do an unbelieveable emulation of Elka Synthex' Laser Harp sound). Jan's only regret is that he was not able to use it more on the album due to time and workflow constraints (had this been available as a software synthesizer it would be much much more prominent on the album). 5. Roland JD-990 (1993) with SR-JV80-04 Vintage Synth board. While not present on the final cut of AET it was essential for some of the mock-up arrangements and until last minute it was supposed to be the synthesizer to recreate the FM "Synth Brass" sound for Ian Freebairn-Smith's arrangements. 6. Yamaha TG-77 (1990). After months of futile attempts to recreate Ian Freebairn-Smith's sounds for SWEET BRITCHES and FIRESTORM using the Roland JD-990 and Yamaha Motif XS this synthesizer was used to design the FM "Synth Brass" sounds, using actual FM Synthesis as in the original. [Jan could also use the sounds from Mark's Yamaha SY77 if he wanted as they are interoperable, however he didn't need to use them in the end]. 7. Yamaha Motif XS6 (2007). The third generation of Yamaha's flagship synthesizer is the main workhorse of Jan's studio and the THE synth for sample-based sounds (whether it is acoustic drums, orchestral instruments or synthesizer complex sounds). For AET it was fed with numerous external samples. Thanks to its unmatched tone generator block and "Xpanded Articulation" technology it was possible to create lush staccato string and brass ensembles. 8. 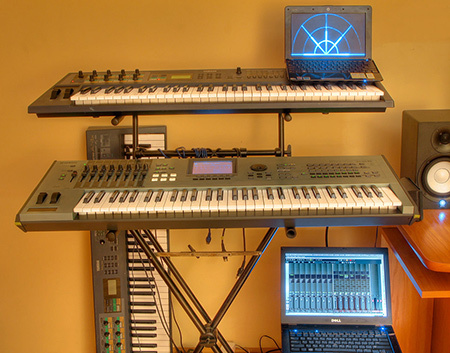 Roland VariOS (2003) with Roland VC-1 card. A backup Roland D-50 emulation essentially. 9. Native Instruments Pro-53 Software Synthesizer. The go-to synth for backing analog synth sounds - basses, drones. Simple, but very powerful. 2 x Apple MacPro 1.1 / 3.1 4-core / 8-core, 12Gb, 4Tb Drives, with ProTools HD 7.4, HD 9 and Pro Tools 10.36 (2012), Avid MBox Pro 3; Amadeus 2.13; Yamaha HS-50 reference speakers; Sennheiser HD 650 reference headphones; Yamaha SY77 synth; Korg MicroKorg XL synth; Roland XP-30 synth with all 5 expansion boards including Roland SR-JV80-04 Vintage Synth; Korg Karma synth, Roland Super JV-1080 synth with JV Orchestral Board; Ensoniq MR Rack synth; Indigo Access Virus synth module; Avid Xpand 2 synth module; Avid Mini Grand module, Native Instruments FM8 module; Vienna Symphony Library ["VSL"] Orchestral Strings I + II; LA Scoring Strings 2.01; Kontakt 5.1; VSL Epic Horns; VSL Fanfare Trumpets; VSL Oboes; VSL Contrabass; Cellos; VSL Tuba; VSL Clarinets; VSL Trombones; VSL Flutes; Orangetree Passion Flute module; Lexicon PCM Native Hall, Room & Plate reverbs.